How do you write a review for a book that is best read knowing as little about it as possible? I rarely go into a book totally blind. I read reviews and I at least read the synopsis. I didn't do that with We Were Liars. The buzz I heard from everyone about this book is to go in knowing nothing. And that's what I'm recommending you do too. 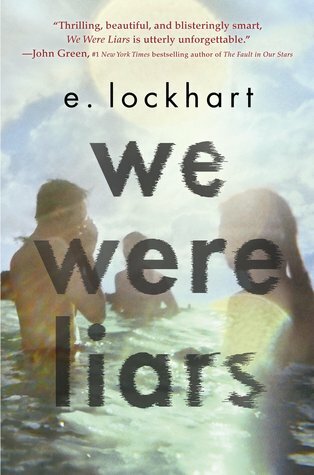 Everyone who talks about We Were Liars mentions that it shocks you. It's a puzzle. It certainly shocked me. But I think it's a wonderful book even without the shocking elements. It's a family drama, about people with too much money and too many problems. It's also a tale about love and friendship, at its best and at its worst. And it does a wonderful job at describing life on the islands off the coast of Massachusetts, a place that's always intrigued me. The writing style is fantastic. The words are spare and somewhat impersonal, but still manage to draw in the reader. It's a very short book and made even shorter, because the prose flies by. The last portion of the book is just as shocking as I heard. I read it on the plane to New York for BEA. I was sobbing for about the last 40 pages. These were sloppy tears. I was crying so much that I couldn't see the screen. I had to keep wiping my face to continue reading. I was lucky that the guy on the plane next to me was sleeping, because he would have thought I was insane. I get teary at books relatively often, but it's very rare that I cry to that degree. If I Stay and Time Traveler's Wife are the last two I remember breaking down over (Oh, and Marley & Me). Read We Were Liars. Don't look up anything about it. I don't even mind if you don't read my cursory review (well, I do mind a little). Just pick it up. It's a beautiful, heart-breaking book that stays with you long after you finish the last page. I also enjoyed this one and didn't figure out the shocking revelation, at least I wasn't really trying to figure it out. I completely agree knowing nothing about the book is the way to go with this one. I only wish it was longer because I wanted to know what happens next. Yes this book was amazing and shocking :) so glad that you loved it too. I so need to read this ASAP! Loved your review. Fantastic review. Makes me want to read it. The title intrigues me. I think it's best to go in to this book knowing nothing about it ! I loved how it was short and shocking. Lovely review! I had the same tug-of-war writing mine because I was so afraid to spoil it for anyone. I'm also a little worried now for If I Stay because I hate crying, but I must read it anyway. Fabulous review and a book I do need to read..... finding the time, that's the only trouble! Glad you liked it. Unfortunately I didn't really like it as much as others did! I actually figured out the *big* thing early on but it didn't ruin my enjoyment of this at all. I was surprised how much I enjoyed it because it has several things that usually annoy me.